Christopher Ward's watches are always on point and usually look about 4 times more expensive than they really are. 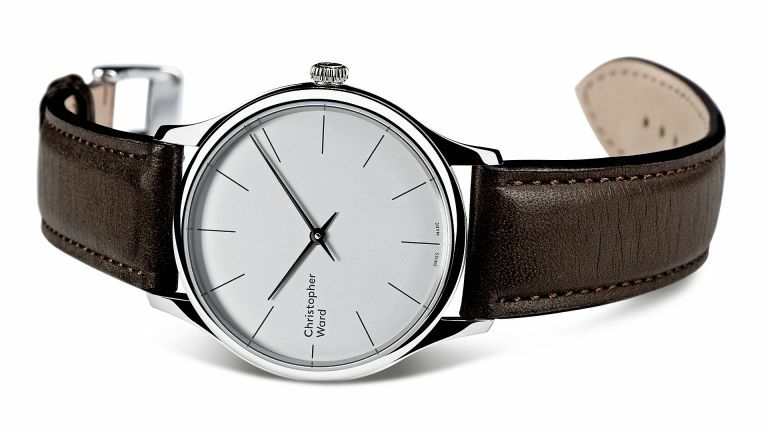 Now the British-designed, Swiss-made maestros of affordable premum launches its slimmest watch to date, the C5 Malvern 595. The Malvern line boasts 'quintessentially English design values', by which we don't mean it comes in a teak box, then falls apart after five minutes. With a depth of just 5.95mm (hence the name) and a 39mm polished 316L steel case, the 595 petite but still projects a certain masculinity. It's like a featherweight boxer. But a handsome one. The glass is anti-reflective flat sapphire crystal. The movement is the Swiss automatic ETA 7001, a 17-jewel mechanism with an incabloc shock protection system and 42-hour power reserve. The dial is similarly stripped down, with no date, numerals or second hand; just Christopher Ward's recently modernised logo and hour markers. The main detail is 'round the back, where a crystal exhibition caseback reveals the movement. The face comes in a choice of pearly white or cool grey, with a sandblasted finish and printed indexes. The black hands are "polished with soft curves to create a monochromatic contrast into the dial". As you can see, the result is extremely easy to read. As a result of the smaller case size, the C5 Malvern 595 is being aimed at both men and women. Although we'd say it looks more blokey with a camel, brown or black leather strap, there is the option of that Milanese mesh bracelet which is arguably more fem-friendly. • Continuing the 595 theme, this version of the C5 Malvern is priced at just £595. That's a bargain, although the price does ramp to £680 if you want the Milanese loop bracelet.